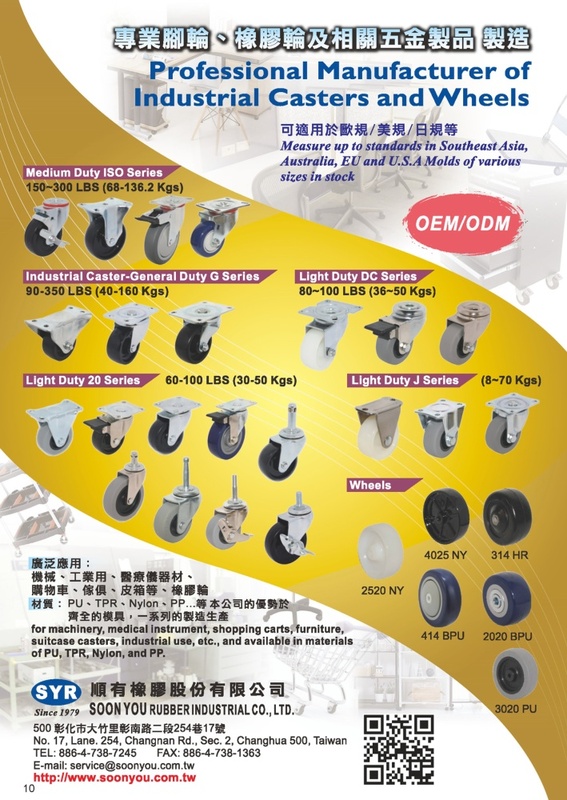 Soon You Rubber Industrial Co., Ltd established at Taiwan in 1979, is specialized at the production of rubber wheel products and casters with more than 30 years’ experience to provide various casters, industrial casters, casters for medical instrument, shopping cart casters, furniture casters, suitcase casters…etc., including the manufacturing of hardware parts and accessories,Company products complete size, diversification, rubber wheel, PU casters, TPR casters, Nylon casters, PP casters…etc. In response to customer demand, OEM/ODM production is available to promote customer’s global market competition. Our products have been sold to the whole world, such as the countries in Southeast Asia, Australia, EU and USA with very good reputation from customers. Since establishment, Soon You has insisted on the professional spirit, excellent quality and quick delivery to uphold the sincere attitude, outstanding service and sustainable management to innovate continuously and provide the best service quality to all our customers. Our products can be broadly used for machinery equipment, medical peripheral device, furniture, office furniture, transportation logistics, food machinery, DIY hardware market and other fields and designed, developed and produced according to customer’s demand to provide the most perfect product service to customers. Welcome to visit Soon You Rubber Industrial Co., Ltd. We sincerely look forward to working with you.